Portrait of Rebeca Tomas by Maly Blomberg. The term “a palo seco” refers to two of Flamenco’s most intimate yet opposing qualities: a deep emotional rawness and a groovy rhythmic playfulness. “Rasgos Flamencos,” as a sequel to the original production, will be true to its namesake, presenting “typical characteristics or features of Flamenco.” However, Tomas has a penchant for presenting some of these characteristic features in a not-so-typical format. Rebeca Tomas, performing with a bata de cola to Regina Spektor’s Apres Moi in A Palo Seco May, 2010 at Theatre 80 St. Marks. Photo by Maly Blomberg. Fresh elements will also be seen in Tomas’ final number, a new solo within the Flamenco style of Alegrias. This piece will be danced in the traditional Bata de Cola (long train dress) and will echo the evening’s first solo by employing a fan at certain points in the dance. In addition, the group number, “Tangos,” has been rearranged and new musical compositions will be debuted. Petite yet strong, Tomas is only 5′ 1″ but appears much larger onstage. Her performance style is sharp, graceful and clean. “Being small, I have a low center of gravity,” she confides. 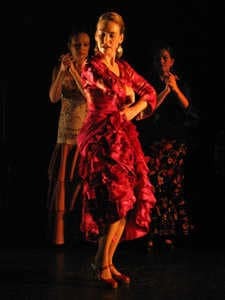 This might be why she can tightly execute a wide variety of turns, from repetitive “heel” turns and pirouettes, to the most famous of the female Flamenco turns, the vuelta quebrada, in which Tomas arches her back so completely that she never takes her eyes off the audience. She has also been praised for the musicality of her footwork, which displays an unusual precision of rhythm. As a dancer, Tomas has freelanced as a soloist with various companies, including Noche Flamenca, Flamenco Vivo Carlota Santana, and Jorge Navarro’s Pasion Flamenca. She trained in Granada at Maite Galan’s Escuela de Danza Espanola and later moved to Madrid, where she studied at the internationally renowned Flamenco academy Amor de Dios. There she appeared at various tablaos, including Al Andalus and Las Carboneras. She is a two-time recipient of the Jerome Foundation’s Travel and Study Grant (2008 and 2010), as well as a scholarship recipient of the school at Jacob’s Pillow (2008). In June, 2010, she won first place in the XIII Concurso Nacional de Flamenco, part of the internationally renowned Festival Flamenco in Albuquerque, New Mexico. In spring 2011, she will be working with the company Revolucion Latina, teaching in their “Beyond Workshop Series” and collaborating with seven other choreographers (some hailing from companies such as Martha Graham and Jose Limon) in order to create a 90-minute piece that features various dance styles in a single thematic performance. Rebeca Tomas in A Palo Seco May, 2010 at Theatre 80 St. Marks. Behind: Laura Castellano and Sol la Argentinita. Photo by Cathy Rocher. Her star is also rising outside the Flamenco performance realm. She recently served as assistant choreographer for the Lincoln Center production of “Women on the Verge of a Nervous Breakdown,” running through January 23 at the Belasco Theater. In January 2011 (coinciding with this production), Tomas will be working on Yaron Zilberman’s upcoming indie-drama, “A Late Quartet.” Tomas will choreograph, train, provide footwork doubling and appear in the movie’s flamenco scene. “A Palo Seco: Rasgos Flamencos” is conceived and directed by Rebeca Tomas. Artists appearing with her include dancers Sol “La Argentinita” and Laura Castellano, guitarist and musical director Pedro Cortes, bass player Sean Kupisz, violinist Ali Bello, percussionist Oscar Valero and singers David Castellano and Barbara Martinez. Lighting design is by Stephen Petrilli. Sound design is by Alex Neumann. Some costumes for Ms. Tomas are contributed by Sally Lesser. Tomas’ website is http://www.rebecaflamenca.com. Performances are January 28-31, 2011 (NOTE UNUSUAL SCHEDULE) at Theatre 80 Saint Marks, located at 80 Saint Marks Place, Manhattan. The schedule is Friday and Saturday at 8:00 PM, Sunday at 3:00 PM and Monday at 8:00 PM. Tickets are $20-$35 and can be ordered through the box office, (212) 388-0388, or online at www.theatre80.org.